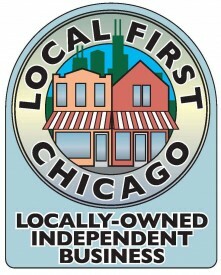 We recently joined the Local First Chicago, a great local membership organization of local owned companies in Chicago. Local First Chicago’s mission is to educate the public on the importance of choosing locally owned, independent businesses. We work primarily through public education, business support, and advocacy. Local First Chicago is a network of locally owned, independent businesses and community organizations joined together to keep money and character in our neighborhoods and build a thriving local living economy. In doing so, we hope to promote the overall social, economic, and environmental health of our economy and communities. Here are 10 Reasons to Shop and Support Chicago businesses like Lakeshore Branding. #1. Keep money in the neighborhood. A recent study in Chicago showed that locally owned, independent businesses put 70% more money back into the local community than chain stores, per square foot occupied. A space filled with a local business rather than a chain puts more dollars back in your neighborhood. #2. Embrace what makes us different. Chicago is a city of neighborhoods. Where we shop, where we eat and hang out – all of it makes our neighborhoods home. Chain businesses change the character of our neighborhoods. If we wanted to live someplace that looked like everywhere else, we wouldn’t be living in Chicago. #4. Create and keep good jobs. #5. Promote competition and diversity. #6. Help out the environment. #8. Put your taxes to good use. Local businesses in neighborhoods need comparatively les infrastructure investment and make more efficient use of public services as compared to nationally owned stores entering the community. #9. Vote with your dollars. #10. Invest in the community. To sign up your business or to learn more about Local First, check out their website and sign up for their newsletters! This list is great. I did not know about Local First Chicago until now. I’ll be checking them out ASAP. Thanks again!